We currently have two PhD positions (fully funded) open to work on areas of galaxy formation and evolution based at the International Centre for Radio Astronomy Research in the University of Western Australia node. The projects will be carried out in collaboration with the theory group at ICRAR. The two PhD positions belong to the science framework of `Feeding and feedback of galaxies' awarded to Dr. Claudia Lagos by the MERAC foundation and supported by ICRAR and UWA. Neutral hydrogen in the cosmic web. Future surveys, such as the Square Kilometre Array and its pathfinders will be studying the neutral hydrogen content of galaxies and the intergalactic medium. In this project the PhD student will be making use of simulations of galaxy formation to compute the expected absorption line features seen towards radio galaxies at redshifts 0.5 to 2. This can be done using both semi-analytic models as well as hydro-dynamic simulations. In this project the student will have the unique opportunity of collaborating with scientists at CAASTRO, Sydney and The Netherlands. Feedback from Super-Massive Black Holes in Galaxies, Positive and Negative. Over the last decade or so, the cartoon picture that interactions trigger powerful outflows from super-massive black holes (SMBHs) that quench rapidly star formation in galaxies has become well established. However, observational evidence suggest a more complex picture in which, for example, a burst of star formation is triggered well before the effect of an outflow from the SMBH becomes apparent. 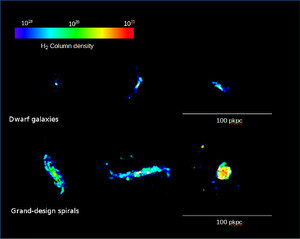 Understanding the connection between the flow of gas onto the SMBH, star formation in this gas reservoir, and the growth of, and subsequent feedback from, the SMBH is crucial if we are to interpret the results of observations - especially in the coming era of large galaxy surveys, when one of the goals is to understand the role SMBHs play in driving galaxy formation and evolution. 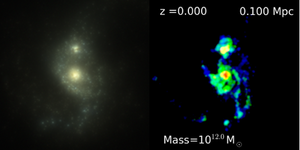 The successful PhD candidate will use gas dynamical galaxy formation simulations, both cosmological and non-cosmological, to study in detail gas accretion, star formation, and SMBH feeding and feedback. They will have unique opportunities to collaborate with world class scientists at UWA and collaborators in the UK and Switzerland. The Satellite Galaxy — Dark Matter Subhalo Connection. Galaxies such as the Milky Way are surrounded by tens of low-mass satellite galaxies, each of which is hosted by its own dark matter halo. Cosmological N-body simulations in the favoured Cold Dark Matter (CDM) model predict that the dark matter halo of the Milky Way should contain hundreds of substructure halos (subhalos), implying that the majority of subhalos must be unoccupied. Assuming that the CDM model provides a reasonable description of dark matter in the Universe, what are the key physical processes that govern the occupation of subhalos with satellites? Are there observational signatures that will allow us to distinguish between these processes? The successful PhD candidate will use a mixture of semi-analytical models and gas dynamical galaxy formation simulations, both cosmological and non-cosmological, to study in detail galaxy formation in low-mass dark matter halos. They will have unique opportunities to collaborate with world class scientists at UWA and collaborators in the UK, Switzerland and Germany. Feeding galaxies: the cycle of gas around galaxies. Most of the baryonic matter in the Universe is known to be outside galaxies, in the form of gas in the intergalactic and intra-cluster medium. The aim of this project is to exactly work on this key aspect of galaxy formation: the modelling of the gas outside galaxies, the channels of accretion onto galaxies and the development of angular momentum in galaxies. A key aspect of this project will be to understand how much gas outside galaxies is in the form of neutral hydrogen and how metals populate the intergalactic medium. Comparisons against observations will be key, particularly with the growing data sets of absorption systems. The successful PhD candidate will be required to work close to both theory and observations, as well as developing computer models of galaxy formation. The latter is particularly relevant for ongoing studies of the conditions of the gas around galaxies using the HST, but also in coming ASKAP surveys. The candidate will be working in the international and world leading environment of ICRAR and making use of its unique computational capabilities. In this project the student will have the unique opportunity of collaborating with scientists at CAASTRO, Sydney and The Netherlands. The formation of dwarf galaxies. 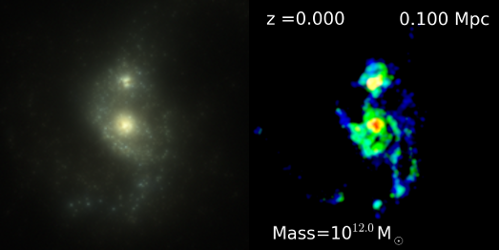 A conundrum of galaxy formation has been to understand the nature of dwarf galaxies. This problem becomes particularly relevant when looking at our own Milky Way and its satellites galaxies. In this project, the successful PhD candidate will be developing more physical models for describing how many stars are formed in low metallicity, low surface density gas; and also exploring the effect of photo-ionisation on the neutral gas content of these galaxies. The predictions of different models are expected to be compared to available observations of Milky Way’s satellites and the wealth of observations provided by large surveys, such as SDSS, GAMA, HIPASS and ALFALFA. The latter modelling is key to understand how much gas we expect in low mass galaxies, in which phases, and their metallicity abundance patterns. This project demands to work close to both theory and observations in order to better assess the strengths and weaknesses of different physical models. The candidate will be working in the international and world leading environment of ICRAR and making use of its unique computational capabilities. If you are interested in these positions please send me (1) a CV (with the names of three referees that can provide reference letters), (2) one page of research experience and (3) one page of research interests for a PhD. Please indicate in your CV relevant academic results (such as raking in your class, english level, teaching and research experience, and any other you may consider relevant for the position). In addition to sending me these documents, please fill the form in Higher Degree by Research, to complete the registration. Please select "MERAC Scholarships" and "Forrest Foundation PhD Scholarships" while applying and nominate Claudia Lagos as supervisor.